The so-called Islamic State says it has killed two Chinese nationals who were abducted from south-west Pakistan by armed men in late May. The IS-linked Amaq news agency made the claim in an Arabic statement on the Telegram messaging app. China's foreign ministry said it was "gravely concerned" and working to verify the information. 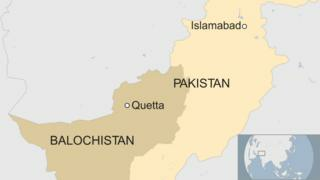 The pair are said to have been studying Urdu at a language centre in the city of Quetta when they were abducted. According to local media reports at the time of the abduction, armed men took the couple as they left the centre. Another Chinese woman just managed to escape during the confrontation. At the time, neither IS nor any other militant group said they had kidnapped the pair. Balochistan has seen kidnappings of foreign nationals in recent years by armed Islamist or separatist groups, sometimes for a ransom. Islamic State controls some territory in Afghanistan and has been seeking to strengthen its hold in Pakistan since 2015 when it carried out its first attack in the country. China is one of Pakistan's major allies, investing heavily in infrastructure projects including nuclear power plants, roads and dams. Under China's One Belt One Road initiative which will see the construction of an economic corridor, Pakistan is likely to see massively increased investment as ever closer links are forged between the countries. Balochistan is the heart of the proposed infrastructure investment. A recent report from the Pentagon also predicts that China will expand its military reach and suggests that it could construct military bases in Pakistan. Is China-Pakistan 'silk road' a game-changer?